Ecological/Physical Description: Pocosin with almost impenetrable jungle of broadleaf, evergreen shrubs and vines. Pond Pine is the principal tree. Located 36 miles south of New Bern, NC in the vicinity of Great Lake, 11 miles north of Onslow Bay and the Atlantic Ocean. Pond Pine, low and high pocosin, mixed pine–upland hardwoods, creek bottom hardwoods. The low pocosin cover type occupies about 82 percent of the natural area. Fire has been an important part of the ecology of pocosins, and it has only been in recent years that fire has been excluded to any degree from pocosins. During periods of drought when the water table levels drop and the pocosins become dry, the fuel in these pocosins becomes very flammable. Blow-up wildfires are not uncommon under these conditions and are virtually uncontrollable once they start. The flora has developed over the millennia with fire as a part of the environment. Pond pine is dependent on fire for dispersal of seed from its serotinous cones. Annual precipitation (type, seasonal distribution): Rainfall is well distributed throughout the year, average about 55 inches (140 cm) annually; July, August, and September are the 3 months with greatest average rainfall. Maximum and minimum temperatures: Its close proximity to the Atlantic Ocean influences the climate year round but probably more so in the winter than summer. Winter temperatures are usually mild; the daily average minimums in January, February, and March are 35.7, 36.1, and 41.7 degrees F, (2.1, 2.3, and 5.4 degrees C) respectively. The average freeze-free period is 235 days. Summers are hot and humid; average daily maximum temperature in July is 90.2 degrees F (32.3 degrees C). Elevation: averages about 25–40 feet (8–12 m) above mean sea level. Geology and Soils: This RNA is in a large pocosin which includes some Carolina Bays. Soils are classified as mucks or Pamlico muck and have a high accumulation of organic matter. The muck is underlain at depths of 20-60 inches with either sand, silt, or clay. In the case of this pocosin, the sub-surface mineral soil is primarily a brown fine sand. Aquatic Features: Pocosin with Carolina bays. Pocosins, or “raised bogs”, can be characterized by poor drainage with water standing near or on soil surface a greater proportion of the year and by their high accumulation of organic matter, high acidity (low pH), low soil oxygen, and deficiencies of certain nutrients, possibly phosphorus and calcium. Plant Communities: Pond pine (Pinus serotine Michx.) is a predominant tree in this and other pocosins. Other trees include sweet bay (Magnolia virginiana L.), swamp blackgum (Nyssa sylvatica var. biflora Walt. Sarg., red bay (Persea Boronia (L.) Spreng. ), and loblolly bay (Gordonia lasianthus (L.) Ellis). Common Shrub Species: Swamp ironwood (Cyrilla racemiflora L.) honeycup (Zenobia pulverulenta (Bartram) Pollard), fetterbush (Lyonia lucida (Lam.) K. Koch), bitter gallberry (Ilex glabra (L.) Gray), sweet gallberry (Ilex coriacea (Pursh) Chapm. ), sweet pepperbus (Clethra alnifolia L.), and dangleberry (Gaylussacia frondosa (L.) T. & G.). Common Herbaceous Species: Chain fern (Woodwardia virginica (L.) Sm. ), switch cane (Arundinaria gigantean (Walt.) Muhl.) and the thorny vine called “bamboo” (Smilax laurifolia L.). Common Mammal Species: Limitations in plant growth in pocosins result in a corresponding limitation of fauna in both quantity and variety. White-tailed deer (Odocoileus virginiana virginiana Zimmermann), black bear (Ursus americanus americanus Pallas), red cockaded woodpecker (Dendrocopos borealis (Vieillot)), alligators (alligator mississipiensis (Daudin)), cottonmouth moccasin (Agkistrodon piscivorus (Lacepede)), wood duck (Aix sponsa (L.), fox squirrel (Scuirus niger niger L.), gray squirrel (Scuirus carolinensis carolinensis (Gmelin), southern flying squirrel (Glaucomys volans volans (L)). American Ornithologists’ Union. 1957. The A. O. U. Checklist of North American Birds. Ed. 5, 691 pp. Prepared by a committee of A. O. U.
W. F., Blair, A. P. Blair, P. Brodkorb, F. R. Cagle, and G. A. Moore. 1968. Vertebrates of the United States. McGraw–Hill, Inc., Second Ed., 616 pp. Carney, C. B., and A. V. Hardy. 1967. Climatologica Summary, New Bern, N. C. Station. USDC En. Sci. Serv. Admin. Weather Bureau. Climatography of U. S. No. 20 – 31. Dachnowski–Stokes, A. P. and B. W. Wells. 1929. The vegetation. stratigraphy, and age of the “Open Land” peat area in Carteret County, N. C. J. Wash. Acad. Sci. 19: 1–11. Davis, W. A., K. V. Goodman, and Z. C. Foster. 1938. Soil Survey of Jones County, North Carolina. USDA, Bureau of Chem. and Soils in Cooperation with N. C. Dept. of Agric. and N. C. Agric. Exp. Stn. Series 1934, No. 4, 27 pp . Ferwald, M. L. 1950. Gray's manual of Botany. American Book Co., 8th Ed., 1632 pp. Gardner, A. L. 1973. The systematics of the genus Didelphis (marsupialia: Didelphidae) in North and Middle America. Texas Tech. Univ. The Museum Special Publications (No. 4). 82 pp. Grant, C. 1945. A biological Explanation of the Carolina Bays Sci. Monthly 61: 443–450. Hall, E. R., and K. R. Kelson. 1959. The Mammals of North America. The Ronald Press, N. Y. Vol I, 1–546 + 79 p. index and Vol. II, 547–1083 + 79 p. index. Johnson, D. 1942. Origin of the Carolina Bays. No. IV of the Columbia Geomorphic Studies. Columbia Univ. Press. 341 pp. Jurney, R. C., W. A. David, and J. J. Morgan. 1934. Soil Survey of Craven County, North Carolina. USDA Bureau Chem. & Soils in cooperation with N. C. Dept. of Agric and N. C. Agric. Exp. Stn. Series 1929, No. 23, 27 pp. Lee, W. D. 1955. The soils of North Carolina, their formation, identification and use. N. C. Dept. Agric. Exp. Stn. Tech. Bull. No. 115, 187 pp. Little, E. L., Jr. 1953. Checklist of native and naturalized trees of the U. S. (including Alaska), Agric. Hdbk. 41, USDA, Forest Service, Washington D. C. 472 pp. Maki, T. E., and W. D. Miller. 1957. Planting pines in pocosins. J. For. 55: 659–663. Munns, E. N., T. G. Hoerner, and V. A. Clements. 1949. Converting factors and tables of equivalents used in forestry. USDA Miscell. Pub. 225. Washington, D. C. Issued July 1935; Revised June 1949. Radford, A. E., H. D. Ahles, and C. R. Bell. 1968. Manual of the vascular flora of the Carolinas. U. N. C. Press, Chapel Hill, N. C. 1183 pp. Wells, B. W. 1942. Ecological problems of the southeastern United States coastal plain. Bot. Rev. 8: 553–561. Wells, B. W. 1946. Vegetation of Holly Shelter wildlife management area. Dept. of Conserv. & Development, N. C. State Bull. No. 2. Wells, B. W., and S. Boyce. 1953. Carolina Bays: Additional data on their origin, age, and history. Elisha Mitchell Sci. Soc. J. 69: 119–141. Wendel, G. W., T. G. Storey, and G. M. Bryan. 1962. 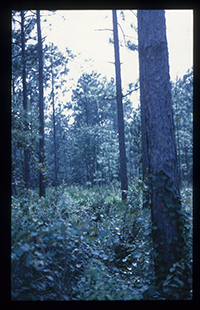 Forest Fuels on organic and associated soils in the coastal plain of North Carolina. USDA Forest Serv. Southeast. For. Exp. Stn. Pap. 144. 46 pp. Wenger, K. F. 1965. Pond pine (Pinus serotona Michx.). In Silvics of forest trees of the United States. USDA Agric. Hdbk. No. 271: 411–416. Wilson, W. F. 1975. Bibliography of N. C. Geology, 1910–1960, Bull. 82. N.C. Dept. of Natural and Economic Resources, Div. of Resource Planning and Evaluation, Mineral Resources Section. Raleigh, N. C.